The Olympics are something that are enjoyed by people all over the world. While there are a diverse range of sporting event to enjoy, not all of them date back to the origin of this world-renowned event. Archery, however, has a history of being part of these games going back to the Paris 1900 games. At this time the events participated in consisted of seven different disciplines. 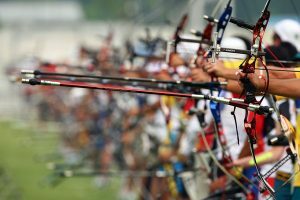 In 1904, archery made its second appearance as an Olympic sport. During this session, only five archery competitions were held and the only participants were those from the United States. In the 1908 Olympics the archery events at regressed even further with there only being three competitions. Then finally to the disappointment of many the sport was not even present in the summer Olympics of 1912. While many thought that this was the end of archery in terms of its presence and popularity at future Olympics, this did not turn out to be the case. Once again this amazing sport returned to the Olympic scene in 1920. From 1972 onward, new rules were put in place all of which seemed to help renew the enthusiasm of the sport. Standardization was put into action and more countries now became more interested in competing. What many don’t realize is that qualification is based on national Olympic committees and not each athlete as it is with some of the other sporting events. This means that these committees are responsible for earning spots and this is based on either a team or an individual. So for example, if a committee earns a spot for a team, they are allowed to enter three archers for a specific event. They are allowed to do this for both male and female. Plus the archers on the team can compete in the individual competition.